Before :- Jawad Rahim, J. Criminal Appeal No. 1719 of 2003. D/d. 20.7.2009. For the Appellants :- K.M. Shiralli, Advocate. For the Respondent :- P.H. Gotkhindi, High Court Government Pleader. Narcotic Drugs and Psychotropic Substance Act, 1985, Sections 20 (b) (1) and 36-A - Indian Penal Code, 1860, Sections 147, 447 and 427 read with Section 149 - Officers though seized cannabis plants seizure termed as seizure of "ganja" - Description of seized products showing that it had stems, leaves , branches etc. - Held, that the same can not be termed as "ganja" in view of definition of ganja given in section 2 (iii) (b) of the Act - Charge against the appellants was for the offence under Sections 20 (a), (b) of the Act - However, the Trial Court found them guilty of offence under Section 20 (b) (i) of the Act - N.D.P.S. Act is self contained in the matters of investigation, preservation of contraband, its certification and production before the Court - Provisions are mandatory in nature - Non-compliance of its provisions renders the conviction under Section 20 (b) (1) unsustainable as the designated Court gets jurisdiction to decide a case only if the punishment prescribed is more than three years - If the punishment prescribed is only upto six months, the Special Court will have no jurisdiction and the trial has to be by a Magistrate under the Cr. P.C. - Non-obstante clause under Section 36-A becomes applicable depending upon the quantum of punishment prescribed - Conviction recorded by the Trial Court as Special Court under the Act set aside - Appeal allowed. JUDGMENTJawad Rahim, J. - Convictied accused is in appeal against the judgment dated 6.11.2003 in Spl. Case No. 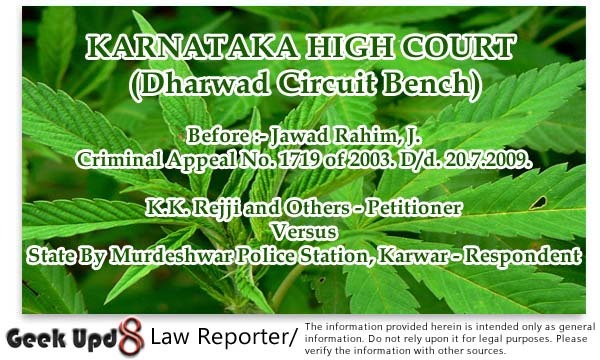 8 of 1998, on the file of learned District and Sessions Jude, Uttara Kannada, Karwar, convicting the appellants for offence punishable under the provisions of section 20 (b) (i) of the Narcotic Drugs and Psychotropic Substances Act, 1985 (N.D.P.S. Act) and under section 25 of the Arms Act, 1959, as also under sections 147, 447, 427 read with section 149 of the Indian Penal Code, 1860. On 4.3.1997 at 16.00 hours, the forest officials inspected the land in Sy. No. 75 of Uttarakoppa Village, Bhatkal Taluk and found the accused 1 to 7 formingan unlawful assembly to trespass upon the said land for removal of 7 forest trees. They had in furtherance of their common object, cut and removed 7 trees from two plots of land measuring 15 guntas and 20 guntas respectively, without permission or sanction from the competent authority. The forest officials found the appellants had thereby committed theft of the forest produce and natural wealth of the State. When the officials further inspected the place they also detected cultivation of ganja on the said land. When they tried to apprehend the appellants, they tried to make good their escape but on further investigation, they found from the residence of the accused harvested ganja weighing 10 kgs. in two bags. A mahazar was drawn seizing the said contraband and further investigation was taken up. 3. To initiate prosecution A.C.F., Bhatkal and R.F.O., Manki with their staff conducted raid at the place of offence and report was lodged at the jurisdictional police station. In the report, it was alleged that though there were 7 persons only petitioners 1, 2 and 3 could be apprehended. The cut trees were seized and the ganja plants cultivated on the land were destroyed. The complainant also recorded that on search he has found 800 ganja plants on two plots, which were removed and destroyed. As the seizure was also effected during the said raid, it was registered at the jurisdictional police and F.I.R. in Crime No. 23 of 1997 and on further in vestigation they seized from possession of the accused as S.B.B.L. gun and that was also recorded in the mahazar. Later R.T.C. extracts were collected to ascertain ownership of the land. Being armed with the F.S.L. report that the forest produce seized from the possession of the accused was in fact ganja, charge was laid for offence punishable under section 20 (a), (b) of N.D.P.S. Act. The accused put up a defence of denial simplicitor but did not lead evidence in their defence. 4. To sustain the charge, prosecution examined 11 witnesses and relied upon 10 documents and produced 10 material objects. 5. The learned Trial Judge considering the ocular testimony of Nagappa Chennayya Nail, Ganesh Shantaram Naik, Nagappa Ganapayya Gonda, John Pedru Fernandes and Manohar Nagu Netrekar, examined P.Ws. 1 to 5, held that the charge was proved and convicted them Against the said order, they are in this appeal. 6. The learned Counsel for appellants seriously disputes seizure of alleged 10 kgs. of ganja from the possession of appellants. He also disputes that accused had grown ganja in the land bearing No. 75 or had cut forest produce. He submits that prosecution itself is vitiated as the provisions of N.D.P.S. Act are violated. 7. Per contra, learned Government Pleader has supported the impugned judgment. (i). Which Court had jurisdiction to try the offence charged? (ii). What was the actual produce seized and what was its quantity? 9. In the first instance, we have to go on the premise that prosecution charge against the accused is based on alleged seizure of ganja. ganja is defined under the provision of N.D.P.S. Act as follows. "2 (iii) (b) ganja, that is, the flowering or fruiting tops of the cannabis plant (excluding the needs and leaves when not accompanied by the tops), by whatever name they may be known or designated". From this definition it is clear that 'ganja' would mean only the flowering or fruiting tops excluding the leaves as also seeds. In the instant case, the prosecution has produced seizure panchanama-Ex. P-5, to show what was seized. It reads as follows. From the extracted portion it is seen what the officers have seized are cannabis plants. The description of seized product shows it had stems, leaves, branches and perhaps even the fruiting parts. But the question is can the stem, leaves, branches be termed as ganja' in view of definition referred to above. The answer is obviously in the negative, because the Act itself defines what is ganja. Not only the raiding party but the investigation officer has not separated fruiting tops or flowering from the ganja plants before weighing. what has been done is they have weighed the entire plants to record the weight as 10 kgs. Since the leaves, stem and branches were also part of the weight (mass), there was no definite weight of actual flowering or fruiting part of the plant (defined as ganja). Hence the evidence produced before the prosecution to sustain the charge is totally vague. If the whole plant is seized, then it will only be a cannabis plant and not ganja. 10. Initially, the charge against the appellant/accused was for the offence punishable under section 20 (a), (b) of N.D.P.S. Act, but the Trial Court found them guilty only for the offence punishable under section 20 (b) (i) of the Act. There is no conviction for the offence under section 20 (a) of the Act. Hence, in was incumbent upon the prosecution to establish it was ganja as defined and its weight. 11. This makes difference because the punishment prescribed by section 20 (b) of the Act depends on the quantity of the contraband seized. The Act prescribes three quantities-small quantity, lesser than commercial quantity but greater than small quantity and commercial quantity. "Section 20. Punishment for contravention in relation to cannabis plant and cannabis. Whoever, in contravention of any provision of this Act or any rule or order made or condition of licence granted thereunder. (b) Produces, manufactures, possesses, sells, purchases, transports, imports inter-State, exports inter-State or uses cannabis, shall be punishable. (ii) Where such contravention relates to Clause (b). Provided that the Court may, for reasons to be recorded in the judgment, impose a fine exceeding two lakh rupees". Therefore, there is no compulsory term of imprisonment envisaged in respect of small quantity, but if offence relates to lesser than commercial quantity but greater than small quantity punishment prescribed is rigorous imprisonment for a term which may extend to ten years and with fine which may extend to Rs. 1 lakh. 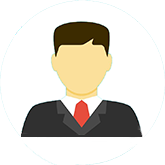 Provided that in cases which are triable by the Special Court when such Magistrate considers. (ii) Upon or at any time before the expiry of the period of detention authorised by him, that the detention of such person is unnecessary, he shall order such person to be forwarded to the Special Court having jurisdiction. (d) A Special Court may, upon perusal of police report of the facts constituting an offence under this Act or upon complaint made by an officer of the Central Government or a State Government authorised in his behalf, take cognizance of that offence without the accused being committed to it for trial. (2) When trying an offence under this Act, a Special Court may also try an offence other than an offence under this Act with which the accused may, under the Code of Criminal Procedure, 1973, be charged at the same trial. (3) Nothing contained in this section shall be deemed to affect the special powers of the High Court regarding bail under section 439 of the Code of Criminal Procedure, 1973, and the High Court may exercise such powers including the power under Clause (b) of sub-section (1) of that section as if the reference to "Magistrate" in that section included also a reference to a "Special Court" constituted under section 36. Provided that, if it is not possible to complete the investigation within the said period of one hundred and eighty days, the Special Court may extend the said period upto one year on the report of the Public Prosecutor indicating the progress of the investigation and the specific reasons for the detention of the accused beyond the said period of one hundred and eighty days. (5) Notwithstanding anything contained in the Code of Criminal Procedure, 1973, the offence punishable under this Act with imprisonment for a term of not more than three years may be tried summarily". Thus, it is seen that a designated Court gets jurisdiction to decide a case only if the punishment prescribed is more than 3 years. If the punishment prescribed is upto six months, then the Special Court has no jurisdiction and the trial has to be by a Magistrate under the Cr. P.C. The non obstante clause contained in section 36-A of the Act becomes applicable depending upon the punishment prescribed. In the instant case as the quantity itself is not specified, the designated Court could not have embarked on the trial. The jurisdictional Magistrate ought to have tried the offence against the petitioners. 14. It must, be remembered that N.D.P.S. Act is a special enactment which is a self-contained constituent not only relating to investigation but preservation of contraband, its certification, its sampling and its production before the Court. Provisions are mandatory in nature and non-compliance to such provisions renders conviction of the appellant for offence punishable under section 20 (b) (i) unsustainable. 15. As regards charge under section 25 of the Arms Act is concerned, seizure of the said gun is effected subsequent to the raid. There is no allegation from any of the witnesses that appellants had used such gun. Merely seizure of gun powder from their possession does not establish contravention of section 25 of the Arms Act, unless established. 16. In the result, noticing contravention of mandatory provisions of the Act and for want of evidence about the actual quantity of ganja, convictior for offence punishable under section 20 (b) (i) of N.D.P.S. Act also must fail. 17. I am satisfied the conviction recorded by the learned Trial Judge can hardly be sustained. Accordingly, appellants are acquitted of all the charge levelled against them.